A turntable that does it all? 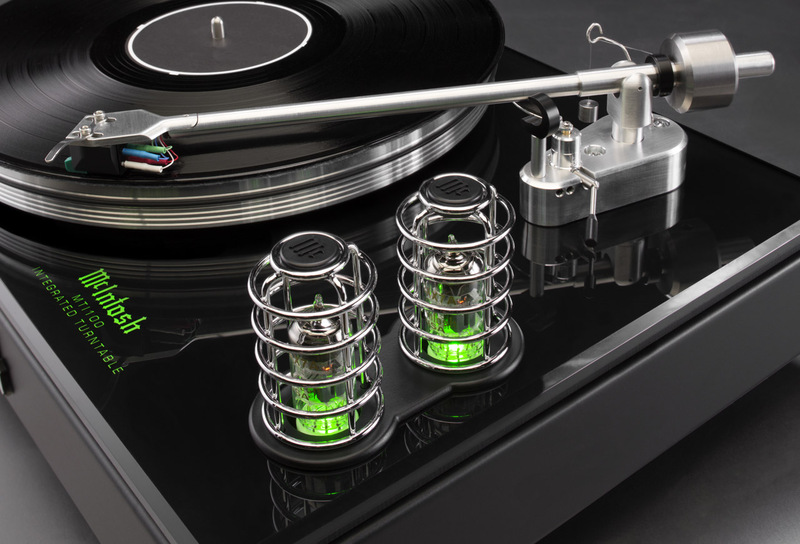 McIntosh has given new meaning to the all-in-one concept by creating a self-contained turntable that includes a phono stage, pre-amp, power amp, DAC and headphone amp – all in a compact form factor not much bigger than a regular disc spinner. At first, the new MTI100 looks like a regular turntable, complete with platter and tonearm. But then you start noticing a few intriguing details: a pair of valves behind protective cages on the right, a more substantial plinth than expected, and a switchgear array on the left. Things get even more interesting when you take a look at the rear panel. It features a pair of substantial speaker binding posts, a selection of digital and analogue inputs, a Bluetooth antenna, a subwoofer output and a pre-out/main-in set. 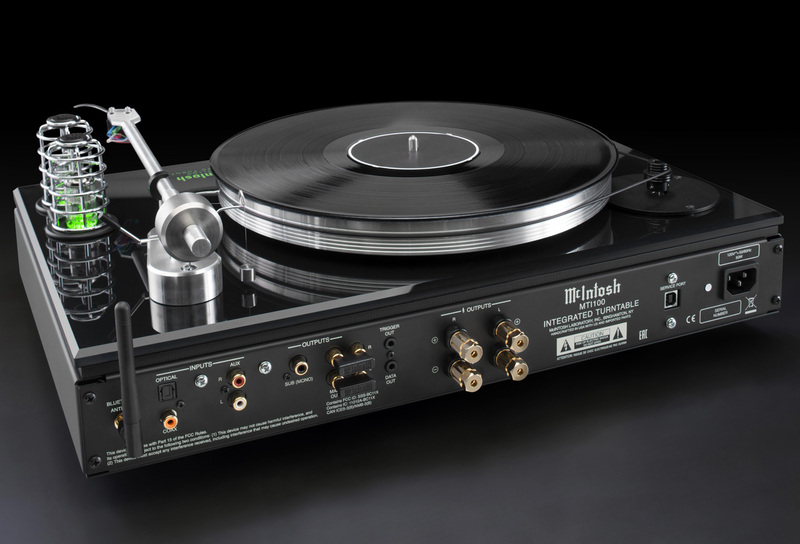 Okay, so the MTI100 isn’t your average turntable after all. 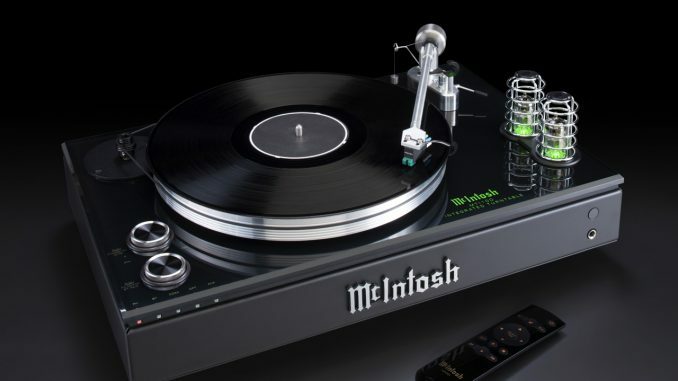 Recognising that many music lovers want less boxes, not more, while still being able to enjoy their favourite tunes from a variety of sources, McIntosh has created an all-in-one turntable. At the heart of the MTI100 is a nicely configured turntable that seems to be up to the task of meeting the performance expectations associated with the brand. A heavy, belt-driven alloy platter and an alloy tonearm with integrated headshell and Sumiko Olympia MM cartridge are the key components. The plinth is a mix of thick glass and steel plate, delivering stability and also forms the top panel of the chassis housing the electronics housed below. Those electronics comprise a Class D stereo power amp, rated at 50 watts RMS/channel into 8 ohms, and coupled to a valve-based pre-amp section featuring twin 12AX7 tubes. A choice of coaxial or Toslink optical digital inputs is provided, as is an analogue stereo input set, allowing ancillaries such as disc players, tuners or TV sets to be hooked up. Control is via a supplied remote control handset, or the switchgear on the unit itself. The MTI100 provides beefy binding posts for a pair of speakers, as well as a subwoofer output for those who like their bass big and beefy. You can also upgrade to a separate power amp by using the pre-amp outputs. SA pricing and availability has yet to be confirmed, but US customers can expect to shell out US$6 500.